The Nasdaq keeps rallying and hurting a trade which I put on last week (same time as I put on the Darden trade). I bought two June 2009 31 Puts on the QQQQ’s (Nasdaq index) at 0.86 ($86 dollars each). Rationale: My rationale for this trade was very ill-conceived and emotional. I literally could not believe the market was rallying so strongly and felt I had to “Get A Piece Of The Action”. While I do not have to call a top perfectly with an option trade to be profitable, it is still foolish to trade emotionally or based on gut-instinct. I bought these options thinking the market would sharply turn down, so I bought June options which will be due on June 29th. Like a fool, I failed to study the chart and I was disconcerted by what I found once I looked at it. There is an obvious double-bottom which is a very bullish indicator. 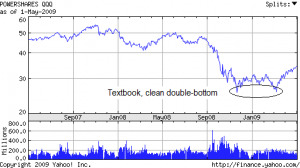 It is nearly a textbook double-bottom, which, despite the fundamentals of the Nasdaq, makes a compelling case for putting in a short-term bottom. A common trading rule of thumb is that tech stocks lead the rally. Meaning, the Nasdaq would be the first place any sign of strength would first appear. As such, if the other indicies (S&P, Dow) aren’t confirming a bottom, this isn’t necessary since the Nasdaq would be the first place strength would appear. 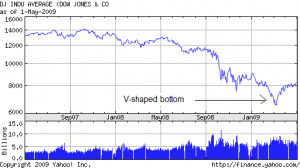 Below is a chart of the Dow, which displays a weak, V-shaped bottom, which is clearly far weaker than the Nasdaq (shown above). I am not very comfortable with this trade, especially since the market has done so well despite news of Swine Flu and the bankruptcy of Chrysler. To feel at ease with your trades, there are certain rules you must obey. Feeling like you need to “Get A Piece Of The Action” is probably the stupidest way to trade I can think of. I have done this numerous times after seeing, reading, or hearing something provocative. Just like you cannot let an errant comment from a co-worker provoke you or cause you to react erratically, you must also exercise this self-discipline and control when trading. Feeling like you need to “Get A Piece Of The Action” is the triumph of emotion over reason. With reverse ETFs, option strategies and leveraged ETFs, there are ways to profit in up, down and sideways markets and you should never have a need to jump in without carefully weighing the pros and cons of a trade. It is better to paper-trade and learn, rather than risk losing hard-earned cash, especially if you don’t have a huge account (like me). Again, there will ALWAYS be opportunities to make money in up, down and sideways markets. Never get into a trade just because you feel you are missing out or you want to feel like you have something at stake in the market. Compared to the Darden trade, the Darden trade looks much better given that it is not a market leader, has more time to show weakness, and has rallied even more sharply/irrationally. My strategy with this will be to set a trailing stop if and when the value of the options double. A trailing stop will allow me to exit the position if the price drops below my stop price, but if the market keeps moving in my favor, it will raise my stop, allowing me lock in even more of the gains. I have never used trailing stops, but hopefully I will get a chance to use them and learn with this trade. Since the total cost of these options were less than $200, I am comfortable holding them until expiration and seeing them expire worthless, if the Nasdaq does not decline strongly. I try to resist GAPOTA trades, but I sometimes succumb to the temptation to risk a little bit of cash when I see such a parabolic rally. Hopefully, the Nasdaq will turn around and I will get to exit gracefully, however, I’ll learn from this trade either way.